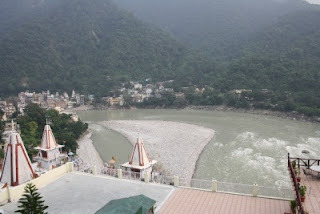 From our experience during a recent visit to the Shivalik mountain range, which forms the foothills of the Himalayas, Rishikesh is a good place to have as a base. We stayed at a 4-star resort near Laxman Jhoola, called Divine Resort. It is a little pricey but the views and location were really nice. Our plans were totally flexible, as we had gone on our own. Flight to Dehradun and a pickup by Taxi to Rishikesh made it quite simple to reach. This visit goes into the category of a relaxed vacation, where there was no-rush-rush plans to visit "lot of spots", "lots of temples", take lots of photos, etc. This vacation was going to be with a plan of limited coverage, including afternoon rest / relaxation. First day we decided to visit Haridwar and Neelkant mountain. On further advice from locals, that Monday was busy day in Neelkant & that we were late in starting from Rishikesh (10:30 AM), we decided to drop Neelkant mountain visit. We went to the bathing ghats of Haridwar. Here Gangaji (as all locals reverently refer to her) is separated multiple times using check-dams and sluice gates to feed multiple "ghats" for bathing. The water is pretty pure with some silt make it look pale greyish-green. We collected only Aqua Fina bottle of Ganga water and found it slightly murky. We took bath at a less than crowded ghat and ate food nearby. Monkeys like these will grab your bags here. The next item on first day's agenda was to visit either Chandi Devi temple or Manasa Devi temple (or both). Since it was a little late and we wanted our afternoon rest, we decided to go to Chandi Devi temple (where car can go till the base of the Rope-car/ Cable-car station). One may have to walk / take a cycle-rikshaw to go the base of Manasa Devi rope-car base station, which is on western side of the Ganges. Chandi Devi is a little way away from Haridwar Ghats and we took that (ease of commute & afternoon sun). We took the rope car up (Rs. 85/ per person except children below 110cm in height) to Chandi-Devi hill and then had a short climb to the temple. The temple has all sides barricaded, which makes taking photographs of panaromic view quite impossible. We decided to skip the visit to Anjana Devi temple in same spot (same Rope-car station), because it was quite hot afternoon and it was another 50 meter climb up (like the one to Chandi Devi). We then decided to return to the resort for some rest and A/C conditions before evening program. The evening program was to see the Aarthi for Gangaji at the Parmarth area. We started late (around 6 PM), some auto fellows did not want to ply from Laxman Joola to Ram Joola & finally reached around 6:15 to northern side of Gangji Ram Jhoola base. We quickly tried to cross and it was becoming quite dark. The hanging bridge with the shakes was an experience, knowing Gangaji was flowing in rapid force directly below. We missed the Aarthi as we reached the spot only at 6:30 PM. We did some shopping of trinkets and returned to our resort by auto. End of day 1 at Rishikesh, wiith primary points being Bath at Haridwar Ghat, Visit to Chandi Devi temple & Ram Jhoola + Aarthi at Rishikesh. We will continue with rest of the visit in next post.